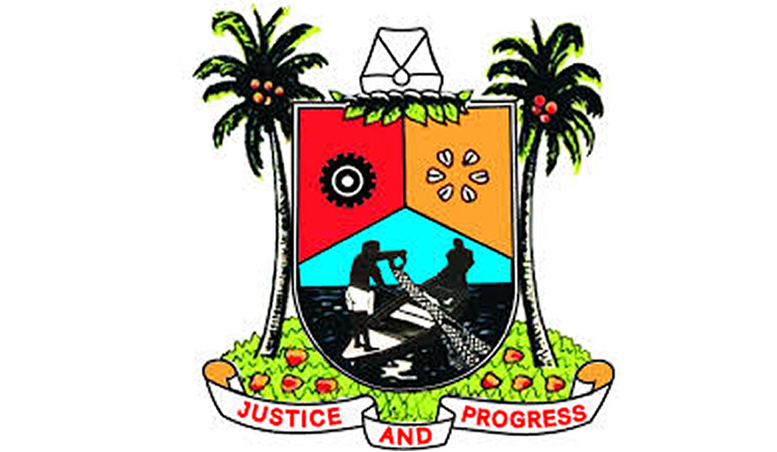 Lagos State Governor, Mr. Akinwunmi Ambode on Tuesday restated his administration’s commitment to implementing the Lagos Development Plan saying his administration has fashioned out a framework to commence the implementation. The Governor, who spoke when a delegation of the UK Department for International Development (DFID) led by the Country Representative, Mr. Ben Mellor, paid a courtesy visit to him in his office, said his administration is setting up a framework which the Permanent Secretaries are already working on. “I would like our development plan and issues that DFID will be assisting us in we should be able to put together issues that are germane to our people and the bottom line has always been that we should do things and carry out programmes that would be of tremendous benefit to the people of Lagos state and that’s what DFID also stands for. We would like you to also know that whatever it is that we are doing, will open up areas that we believe will be of benefit to Nigerians in general”, he said. Lagos State Governor, Mr. Akinwunmi Ambode (right) receiving Transition briefing notes on DFID partnership with Lagos State Government from South West Regional Coordinator, DFID, Head of Lagos Office, Mr. Sina Fagbenro-Byron (left) while the Head, DFID Nigeria, Mr. Ben Mellor (left) looks on during a courtesy visit to the Governor by DFID, at the Lagos House, Ikeja, on Tuesday, August 18, 2015. He said the Development Plan is geared towards achieving the vision of the government in all sectors on the long-term. The Governor said he remains a firm believer in the basic principles of good governance, which according to him, thrives on accountability and all inclusive governance, just as he restated his commitment to run a transparent and all inclusive government that would not only be accountable, but also be people-driven. “Lagosians must be able to speak about the kind of government they want, we must also be accountable to them, we should be able to explain to them in every facet of our administration what we are doing and then government should also be participatory”, he said. Governor Ambode said he has concluded plans to embark on a tour of the 57 local governments in the state, saying it would afford him the opportunity to listen to the challenges of the people first hand and address them accordingly. 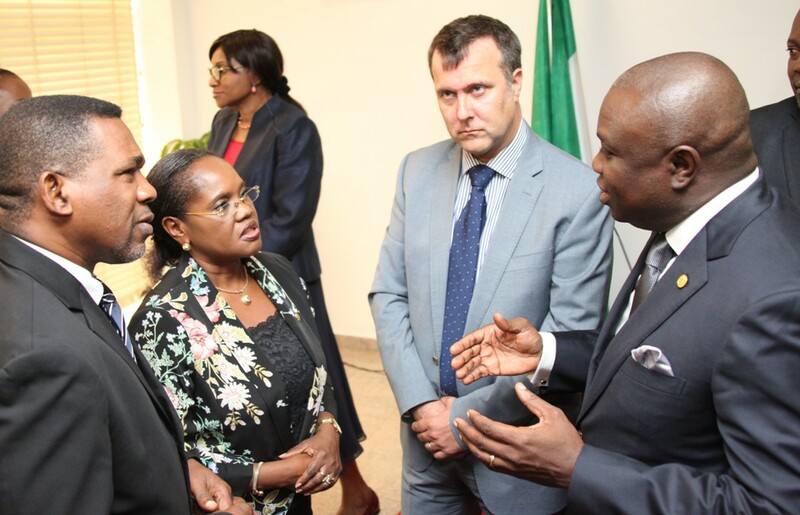 Lagos State Governor, Mr. Akinwunmi Ambode (right) discussing with the Head, Department For International Development (DFID) Nigeria, Mr. Ben Mellor (2nd right), Head of Service, Mrs. Folashade Jaji (2nd left) and South West Regional Coordinator, DFID, Head of Lagos Office, Mr. Sina Fagbenro-Byron (left) during a courtesy visit to the Governor by DFID, at the Lagos House, Ikeja, on Tuesday, August 18, 2015. 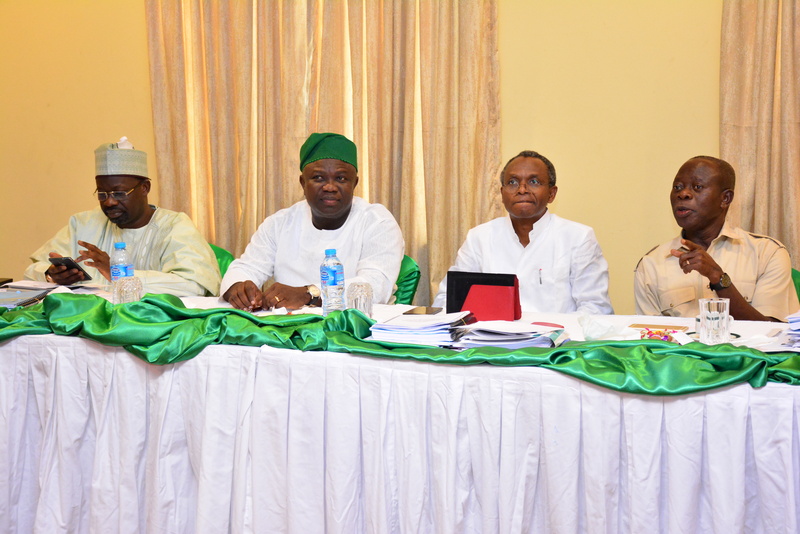 “We believe strongly that we should scale up community governance in this state. It is more about communities, its more about our people and what they want”. He commended the partnership of the State Government and the DFID over the years, saying it has not only being a success, but has impacted on the people in no small way. 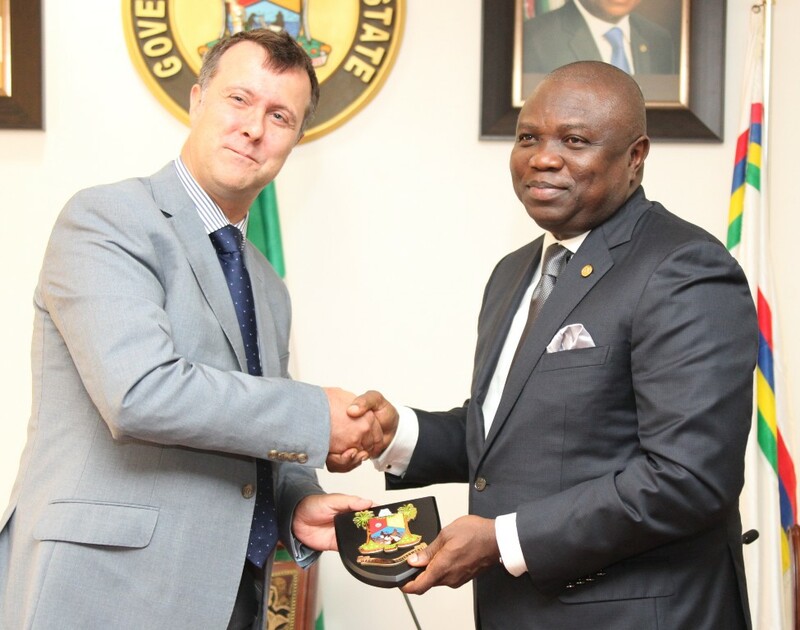 “I want to thank the DFID, you’ve always been a partner in aid, and you have always felt everything good about Lagos. I have been a beneficiary of one of your programmes while working here, so obviously you have a good friend in the governor and in this administration”, he said. He expressed optimism that the synergy between Lagos and the Federal Government for the first time in 16 years, will go a long way to scale up the partnership with the DFID and share the model to other states of the federation. Lagos State Governor, Mr. Akinwunmi Ambode (2nd left) discussing with the South West Regional Coordinator, DFID, Head of Lagos Office, Mr. Sina Fagbenro-Byron (right) during a courtesy visit to the Governor by DFID , at the Lagos House, Ikeja, on Tuesday, August 18, 2015. With them are the Head, Department For International Development (DFID) Nigeria, Mr. Ben Mellor (2nd right) and State Programme Manager, DFID-SPARC, Mr. Ifeanyi Peters Ugwuoke (left). 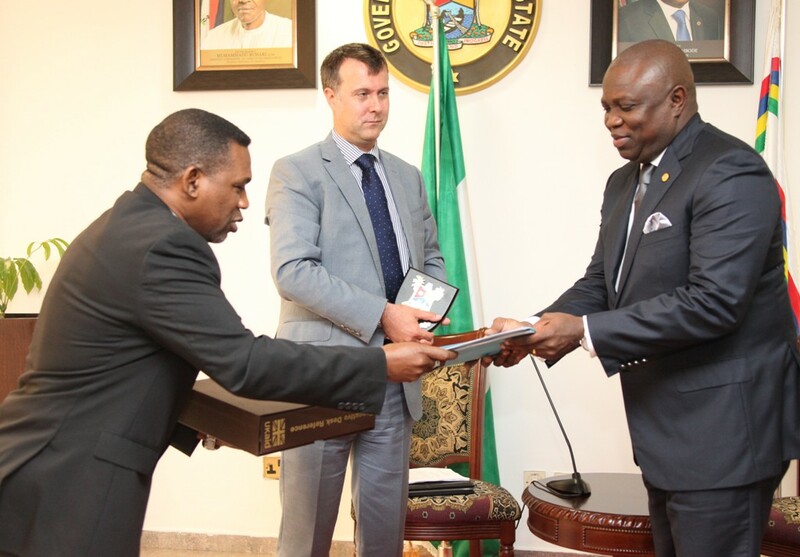 Earlier, Mellor in his remarks commended Governor Ambode for his strides since he assumed office, just as he noted that his decision to run an all inclusive government was one that conforms to the ideology of the DFID. He lauded the steps taken by the Governor so far to achieve his vision saying his decision to align ministries and engender public service reforms will not only increase proactive and performance based strategic administration, but will also improve service delivery to the people. “On economic growth for the private sector, I commend you for the formation of Lagos Global to provide investment promotion and facilitating services for prospective Foreign Direct Investors”. 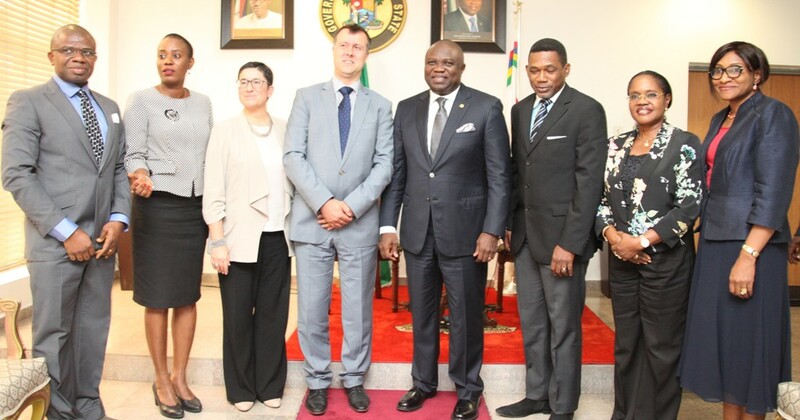 Lagos State Governor, Mr. Akinwunmi Ambode (4th right) in a group photograph with the Head, Department For International Development (DFID) Nigeria, Mr. Ben Mellor (4th left), South West Regional Coordinator, DFID, Head of Lagos Office, Mr. Sina Fagbenro-Byron (3rd right), Head of Service, Mrs. Folashade Jaji (2nd right), Permanent Secretary, Office of Overseas Affairs & Investment (Lagos Global), Mrs. Arinola Olufunmilayo Odulana (right), State Programme Manager, DFID-SPARC, Mr. Ifeanyi Peters Ugwuoke (left), DFID Regional Programme Officer, Margaret Fagboyo (2nd left) and Private Sector Adviser, DFID Lagos, Alessandra Lusrati (3rd left) during a courtesy visit to the Governor by DFID, at the Lagos House, Ikeja, on Tuesday, August 18, 2015. 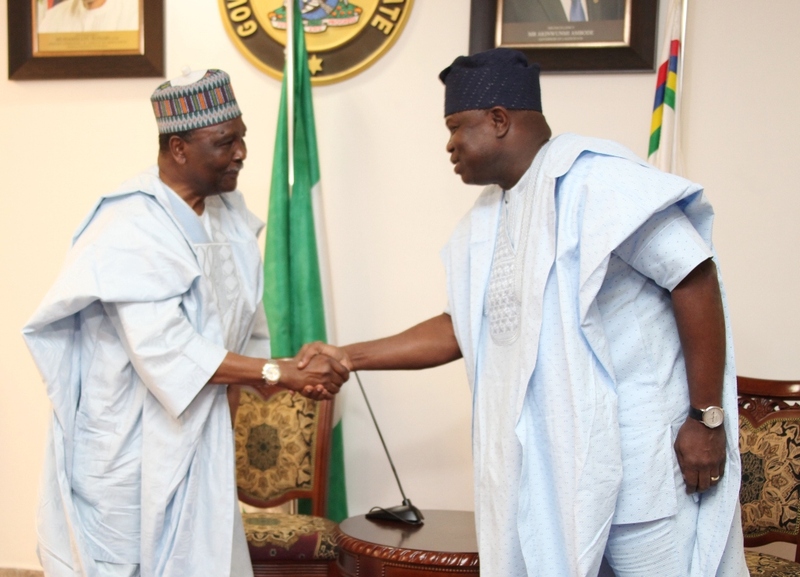 Lagos State Governor, Mr. Akinwunmi Ambode on Friday received the former Military Head of State, General (Dr) Yakubu Gowon Rtd, and other Executives members of ‘Nigeria Prays’, where he urged Nigerians to continue to coexist peacefully and pray for the continuous unity of the nation. Speaking at the Lagos House, Alausa, Ikeja, the Governor, praised the former Head of State for his relentless effort in pursuing national peace and unity from the period he became Head of State till date. “I also quickly recall that at the end of the civil war in 1970, your good self declared that there was no victor and no vanquished and the main reason why you did that was because you wanted to create a platform for the future unity of Nigeria and that is why we are so glad to receive you here today”. “All these point to the fact that you have an unalloyed commitment to the unity of all Nigerians irrespective of where they come from and that is what we are very proud of in Lagos”, he said. 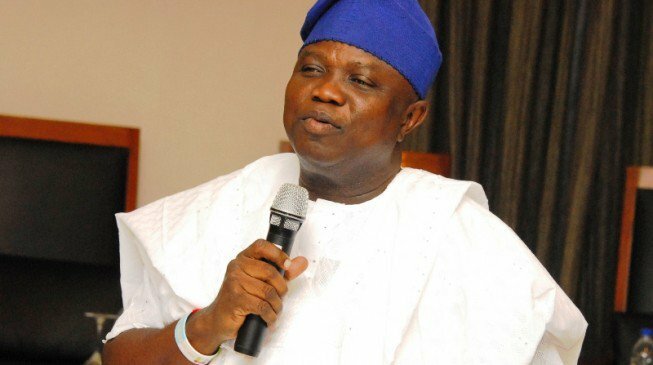 Governor Ambode recalled that it was the Former Head of State that created Lagos, adding that it remains the only state that has not been divided despite the different tribes and religious difference of people living in Lagos. “Lagos remains a major cosmopolitan state and all Nigerians from different tribes and all walks of life actually living in the last 48 years since it was created it may please you to know that His Excellency is actually the one that created Lagos State in May 1967. “It remains the only state that has not been divided ever since you created it since 1967. I remember also that the former Head of State was the person who created Unity Schools when they were created for the cohesion of Nigerians and to create future leaders of which I am a product of Unity School”, he said. While urging Lagosians to join the group in praying for Nigeria, the Governor said that the success of the 2015 general election could not have been possible without divine intervention. “So, obviously it’s just a manifestation of the greater blessings of the collective will of Nigerians to come together to lift up Nigeria spiritually and we can see that the future can only be better than what it has been in the past”, Governor Ambode said. Earlier, the former Head of State said he and his team were in Lagos to pay homage to the Governor saying he has done some incredible work for the group. He also lauded the Governor for graciously accepting to host the prayer session for the South West zone. He said the group was ready to partner and pray for the country, adding that the change mantra has started to manifest in greater blessings for the nation just as he prayed for divine wisdom and courage for the Governor in his quest to move the state forward. According to him, “It is only God that can help any nation solve its challenges. We all should pray often for this country. In as much as we pray sincerely and not for selfish reasons, I know that God will answer our prayers”. 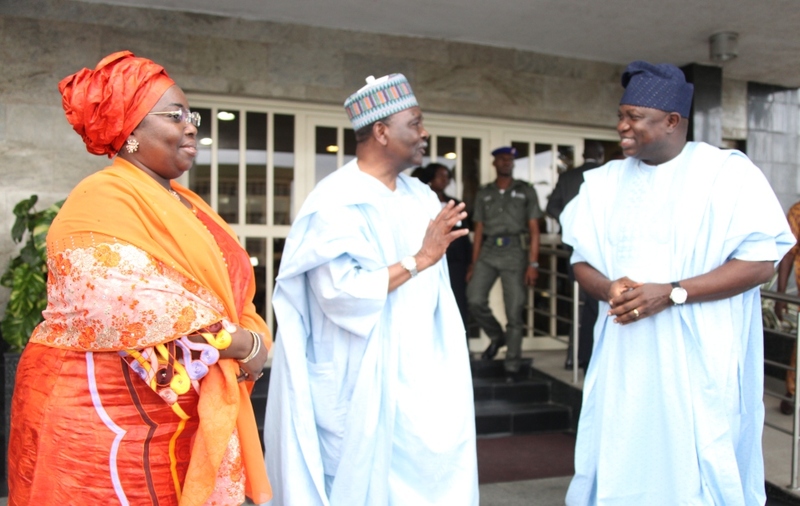 Lagos State Governor, Mr. Akinwunmi Ambode (right) welcoming the former military Head of State, Gen. Yakubu Gowon, rtd. (left) during a courtesy visit to the Governor by the former military Head of State and Coordinators of Nigeria Prays at the Lagos House, Ikeja, on Friday, August 14, 2015. 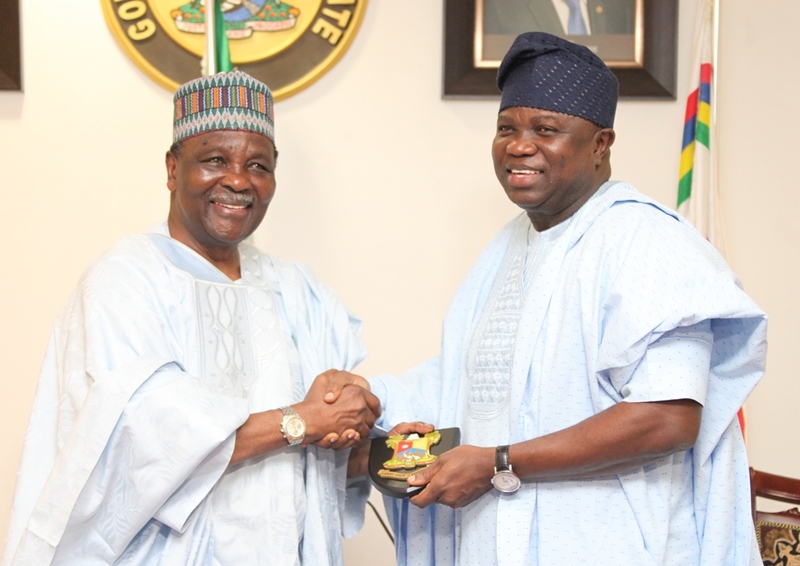 Lagos State Governor, Mr. Akinwunmi Ambode (right) with the former military Head of State, Gen. Yakubu Gowon, rtd. (left) during a courtesy visit to the Governor by the former military Head of State and Coordinators of Nigeria Prays at the Lagos House, Ikeja, on Friday, August 14, 2015. Lagos State Governor, Mr. Akinwunmi Ambode (4th right), his Deputy, Dr. (Mrs.) Oluranti Adebule (3rd right), the former military Head of State, Gen. Yakubu Gowon, rtd. (4th left), Captain Thahal (3rd left), South West Zonal Coordinator, Nigeria Prays, Evang. Jones Adenmolu (2nd left), Lagos State Coordinator, Nigeria Prays, Rev. Toyin kehinde (left), Coordinator, Contact Committees, Nigeria Prays, Bishop Theoplilus Taiwo Ajose (2nd left, behind), Ekiti State Coordinator, Nigeria Prays, Evang, Enoch Ajibade (left, behind), Secretary to the State Government, Mr. Tunji Bello (2nd right), Permanent Secretary, Ministry of Home Affairs, Mrs. Grace Oladimeji (right) during a courtesy visit to the Governor by the former military Head of State and Coordinators of Nigeria Prays at the Lagos House, Ikeja, on Friday, August 14, 2015. Lagos State Governor, Mr. Akinwunmi Ambode (2nd left) with the former military Head of State, Gen. Yakubu Gowon, rtd. (left), Deputy Governor, Dr. (Mrs.) Oluranti Adebule (2nd right) and Secretary to the State Government, Mr. Tunji Bello (right) during a courtesy visit to the Governor by the former military Head of State and Coordinators of Nigeria Prays at the Lagos House, Ikeja, on Friday, August 14, 2015. 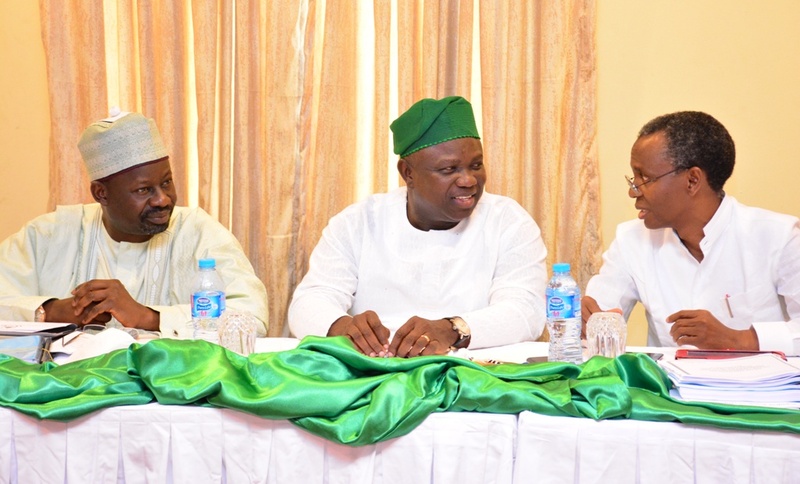 Lagos State Governor, Mr. Akinwunmi Ambode (middle) discussing with his Kaduna State counterpart, Mallam Nasir El-Rufai (right) while Gombe State Governor, Alhaji Ibrahim Dankwambo (left) watches during the Adhoc Committee meeting of NEC on Accruals to the Federation Account at the Banquet Hall, State House, Abuja on Thursday, August 13, 2015. Lagos State Governor, Mr. Akinwunmi Ambode (2nd left) with his Akwa Ibom and Gombe States counterparts, Mr. Emmanuel Udom (right)and Alhaji Ibrahim Dankwambo (left) during the Adhoc Committee meeting of NEC on Accruals to the Federation Account at the Banquet Hall, State House, Abuja on Thursday, August 13, 2015. 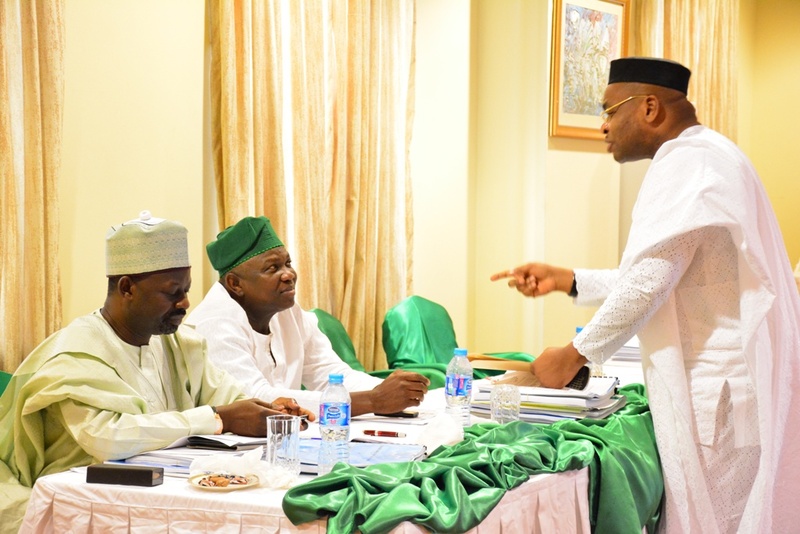 Lagos State Governor, Mr. Akinwunmi Ambode (left), his Gombe and Akwa Ibom States counterparts, Alhaji Ibrahim Dankwambo (middle) and Mr. Emmanuel Udom (right) during the Adhoc Committee meeting of NEC on Accruals to the Federation Account at the Banquet Hall, State House, Abuja on Thursday, August 13, 2015. 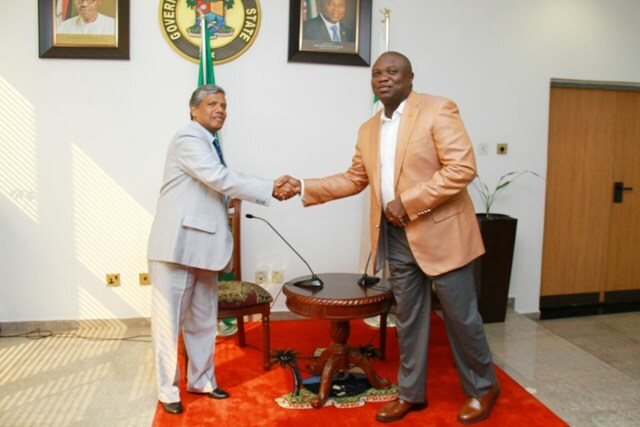 Lagos State Governor, Mr. Akinwunmi Ambode, at the weekend received the High Commissioner of India, Mr. Ajjanpor Ghanashyan where he reaffirmed his administration’s commitment to strengthen trade relationship with investors from the country. The Governor, who received Ghanashyan in his office at the Lagos House, Alausa, Ikeja, assured of his administration’s determination to further strengthen the trade with the country, adding that, he has created an Office of the Overseas Affairs and Investment, which under his supervision, to make the state more investor-friendly and safer. “We have established Office of Overseas Affairs and Investment, so that we can strengthen bi-lateral relationship. We need more investors to come into Lagos so that we can create employment and grow our GDP. Whatever it is you think we can do to increase investors from India, we are ready to talk,” he said. 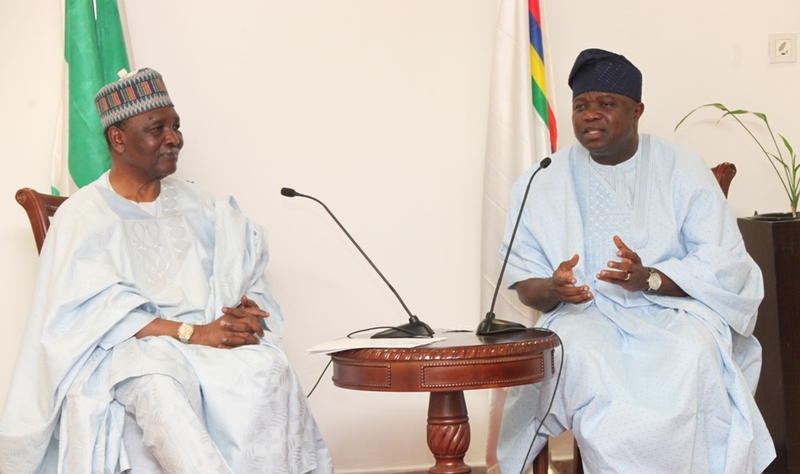 The Governor expressed his appreciation to the visitors saying that Lagos could draw inspiration from India as a modern democracy and from the way the economy was conducted despite its huge population. He assured the High Commissioner that the state is ready to expand its frontiers to accommodate investors willing to set up their businesses in the state. “We are in dire need of a platform that allows for food security since this would further towards making robust achievement at transforming the lives of residents of the state, improve the economy of the State, increase the internally generated revenue, IGR, and translate to further employment opportunities for our unemployed youths” the Governor said. Governor Ambode listed software technology, manufacturing as well as Agro and Agro-allied sectors as possible areas where such bi-lateral relations could be strengthened, assuring them that the state is safe, conducive and investor-friendly to accommodate new businesses and investors willing to partner with Lagos. Earlier, High Commissioner of India, Mr. Ajjanpor Ghanashyan expressed the willingness of his country to partner with Lagos as it is the economic hub and capital of Nigeria as well as home to many India investments. 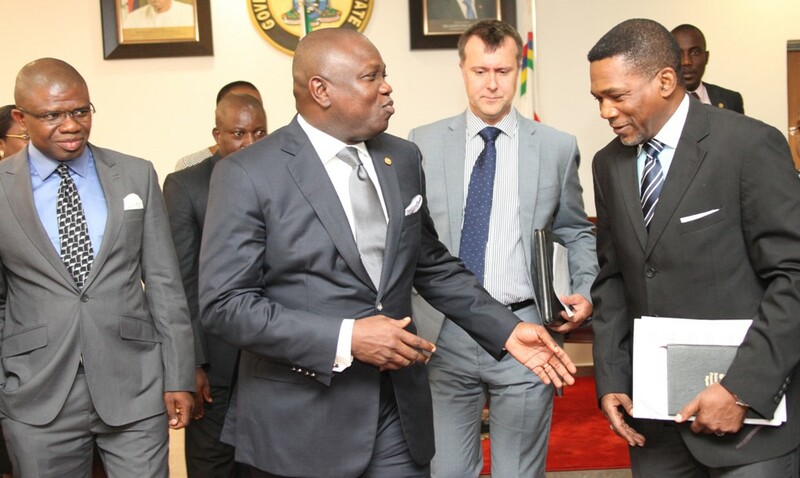 He informed the Governor that the crux of the visit was to invite him to address a delegation of 150 businessmen that would visit Lagos in the coming weeks on a mission to seek ways to strengthen bi-lateral trade between India and Lagos State.